The first working model of the Radiotype was fabricated in 1931 in the laboratory of Radio Industries Corporation under the direction of Walter S. Lemmon, who was then the company's president, Clyde J. Fitch, an engineer, and A. M. Nicolson. Lemmon later demonstrated the working model to IBM's president Thomas J. Watson, and rights to the product were acquired by IBM in August 1933. Walter Lemmon then became general manager of IBM's new Radiotype Division, and he was joined there by Fitch and Nicolson. 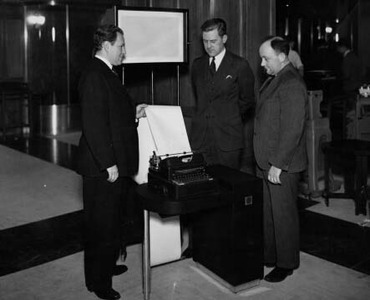 Shown above in 1938 are (from left) Walter S. Lemmon, general manager of IBM's Radiotype Division, Clyde Fitch, IBM research engineer, and Albert C. Holt, IBM field engineer, at the IBM World Headquarters Radiotype installation. In 1935 Admiral Richard E. Byrd successfully sent a test Radiotype message 11,000 miles from Antarctica to an IBM receiving station in Ridgewood, New Jersey. Six years later, IBM lent Radiotype machines to the U.S. Signal Corps for tests between Washington, D.C., and Dayton, Ohio. These tests were conducted by Albert Holt, an IBM field engineer in the Radiotype Division. With the U.S. entry into World War II, the Signal Corps ordered quantities of the Radiotype machines to equip its stations in San Francisco, Honolulu, Panama, Puerto Rico and elsewhere. 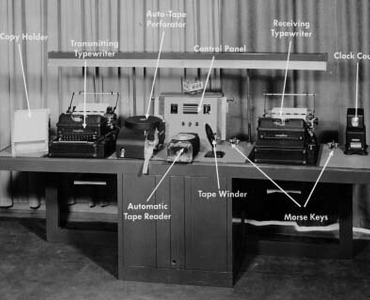 The IBM Radiotype station, including sending and receiving units, at "WAR," the radio station of the U.S. Army Signal Corps Communications Center in the Pentagon, shown above in 1944.